Jordan Hall is the Middy Elite Match champion for the second year running. 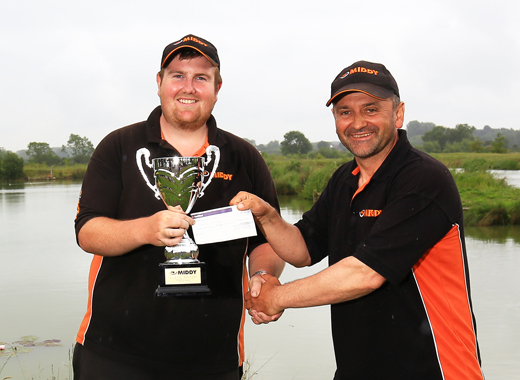 Jordan Hall secured an emphatic victory at Rushfield Lakes on Friday, to claim his second successive Middy Elite Match Trophy. A match win was never going to be easy against such a competent field. On an unfamiliar lake - which holds an abundance of silverfish, small carp, F1s and a huge amount of quality carp with many in double figures - tactics would need to be right and maybe a bit of luck mixed in. The draw seemed to hold little relevance to most of the field as it was a venture into the unknown and a case of just dealing with the match as it evolved, fishing to your strengths to get the most from the swim. The draw seemed to fancy the end pegs so Kieron Rich on 2, Lee Werrett on 8, Davie Corcoran on 22 and Andrew Quarmby on 27 looked favourites. On the day the lake was flat calm with changeable light conditions so it was likely the silver fish would play their part and could well be the deciding factor, so mixed tactics were definitely a safe bet and a carp-only approach a risky strategy. On the whistle all the anglers were catching on all methods - Kieron taking a couple of early carp on the method feeder, Jordan some early fish on paste and Thomas Mille fishing like a true Frenchman and catching silver fish at a good pace. In the early stages it was only really Steve Gregory that appeared to be struggling on peg 23 so already Steve was going to have to rely on the carp feeding later in the match. As the match progressed, it was evident the big carp were going to prove difficult to catch and they soon came up in the water and were cruising about out of pole range. They showed little interest in feeding and no desire to participate in the method feeder tactics employed by some, so it was silvers all the way and most of the anglers were just really trying to keep something going into the net. The one exception was Andrew Quarmby who, on an end peg with carp in the area, decided he would stick with the method and hopefully be the first to capitalise when, or maybe if, they fed. Chris Cameron was catching plenty of ide, Dale Calvert was catching tench and the French contingent of Thomas Mille and Sébastien Campagne were looking very much at home on the silver fish race. A few of the field managed to mug a cruising carp as they drifted into range, but it was only Lee Werrett who was looking likely to catch carp as they put in an appearance in his margin. Being a corner peg the potential for a good weight looked promising, but after losing a couple of eight-pounders Lee's weight didn't really build and all margin potential faded away. As the match moved to the fourth hour it was still really an open affair and any one of the anglers could still win. Jordan was making steady progress and with a couple of carp caught shallow he was setting himself up nicely, but attention had switched to Steve Gregory who was now starting to catch carp from the margin - they were good fish and he had now moved right back into contention. In to the last hour the match changed. Focus switched to the carp and some swift tactical manoeuvres followed. Jordan switched to his margin with groundbait and worm, timed to perfection the carp obliged. But as he glanced up he watched Chris Cameron drop his method feeder to the far bank and first cast take a near double carp. With Steve Gregory still catching it was game on for the closing stages and with no clear leader it was going to be a tight finish. With Kieron and Lee's margins not producing it was looking like Jordan, Chris or Steve were most likely to lift the trophy. Chris was now firmly on track with the method feeder, but the fish maybe weren’t big enough to pull it back and with Steve's margin not really moving up a gear it was Jordan who was looking favourite with his margin producing good fish to groundbait and double worm to deliver a convincing finale. Assisted by a fair percentage of his weight being made up of smaller carp and silvers, Jordan displayed a good mix of tactics and timing for a well-deserved win. 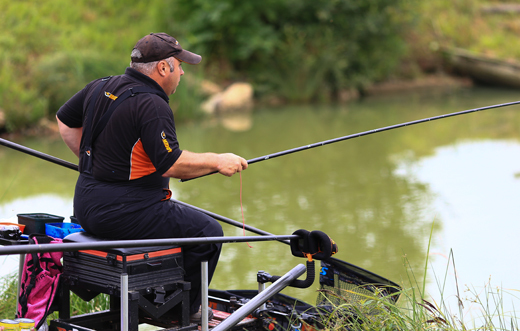 Steve Gregory managed to hold onto second place and Chris Cameron's late charge on the method feeder left him agonisingly close to second place by only seven ounces - one more fish! Two steady performances from Davie Corcoran and Ashley Clements resulted in 4th and 5th respectively with 59lb and 57lb and a few carp adrift of the front-runners but making the prize list all the same. The top three received cheques from Middy, while Jordan also lifted the trophy for the second year in a row. He will be even keener to defend it next year and will hope to become the first angler ever to win on three occasions. 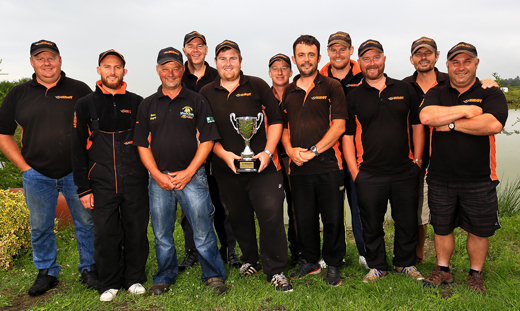 Middy's match team co-ordinator Steve Haywood commented, "this event was hosted by Steve Gregory at Rushfield Lakes and provided a day of pure match fishing and decision making, resulting in a very close match and a worthy champion. A big thank you from all for Steve's hospitality. We'd also like to especially thank Thomas Mille and Sébastien Campagne, who made such a long journey from France to be here today." => Jordan Hall is the Middy Elite Match champion for the second year running. > Tom Pringle wins the Middy Winter Series! > Pete Upperton wins Match This! > Chris Cameron wins Match This! > Ben Fisk in the Match This Final! > Chris Cameron through to Match This Final! > Myles wins mega cash prize! > WIN a 4G Rod! > White Knuckle Whips Back In Stock! > MIDDYS REVOLVER GUNNA BE ROLLIN EM IN STOCK! > Battle Zone gets better! > 93-13 in demand at the top! > X-Flex makes an impact!